This idea that you should throw away your toothbrush after you’ve been sick is getting out of hand. I just saw that recommendation again on two dental blogs this past week. It’s not true. This is an idea that has been pushed by toothbrush companies that is not backed by any scientific research whatsoever. In fact, my research turned up only one scientific study on the subject—a 2013 study at the University of Texas that was published by the American Academy of Pediatrics. It showed that transmission of strep throat via toothbrush did not happen. There is no scientific evidence to back up this claim. Yes, you can catch a cold right on the heels of recovering from a cold. But it will be a different cold virus—not the one you just fought off. You have developed antibodies to that virus and are now immune to that particular strain. 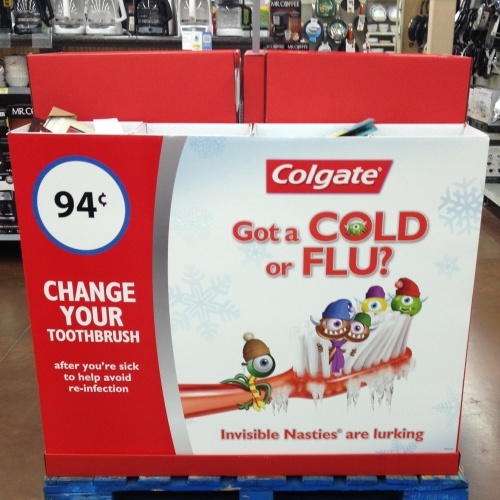 So you can’t reinfect yourself. So says Dr. Caroline Rudnick, an assistant professor of community and family medicine at St. Louis University. If that’s not enough to satisfy you, you have another option—sterilize your toothbrush. How? With simple chlorine bleach (e.g. Clorox). The Centers for Disease Control explain the excellent bactericidal properties of chlorine bleach. Just put a little bleach into a cup, enough to cover the head of the brush, soak your brush in it for about five minutes, rinse, and you’ve got a sterilized brush, cleaner than when you opened the package. There will be no residue or aftertaste. Chlorine bleach would be used in medical and dental applications except for some negative properties. It bleaches clothes and other objects, and it is extremely corrosive to metal. It also can form toxic chemicals if allowed to come into contact with certain other medical disinfectants. 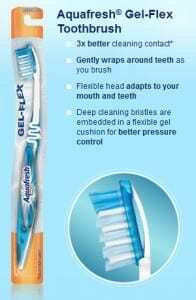 I had a chance to try the Aquafresh Gel-Flex toothbrush. I give it one star out of five, and here is why. Alexander Pope gave us the famous quotation, “A little learning is a dangerous thing.” This toothbrush appears to be based on the true notion that soft toothbrushes are better than hard ones, but it applies the principle completely incorrectly and, by so doing, it reduces its effectiveness. The flexible handle and the cushioning in the head are both supposed to help prevent you from pushing too hard. However, a major purpose of having soft bristles on your toothbrush is to enable the bristles to get into the cracks and crevices both between adjacent teeth and between the teeth and the gums. The cushioning in the Gel-Flex defeats that purpose. Yes, it is possible to damage your gums by brushing too hard, and this brush certainly prevents that. But a soft-bristled brush will also prevent gum damage while providing the added advantage of cleaning effectively, which this brush does not. Part of me wants to give this brush zero stars, but there is a possible benefit to the cushioned design. If someone is an over-aggressive scrubber, this toothbrush could help break them of this habit. Provided you could even get them to use this toothbrush. So we’ll go with one star. It’s certainly better than a hard brush. I don’t like the deceptive design. It leads astray people who would otherwise get a really good brush.